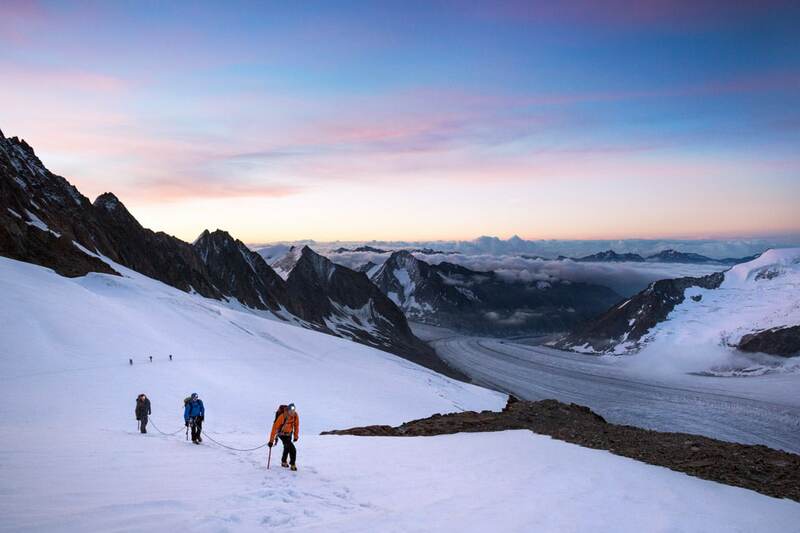 Climbing the Finsteraarhorn, in summer, feels more like an expedition than a typical Alps outing. 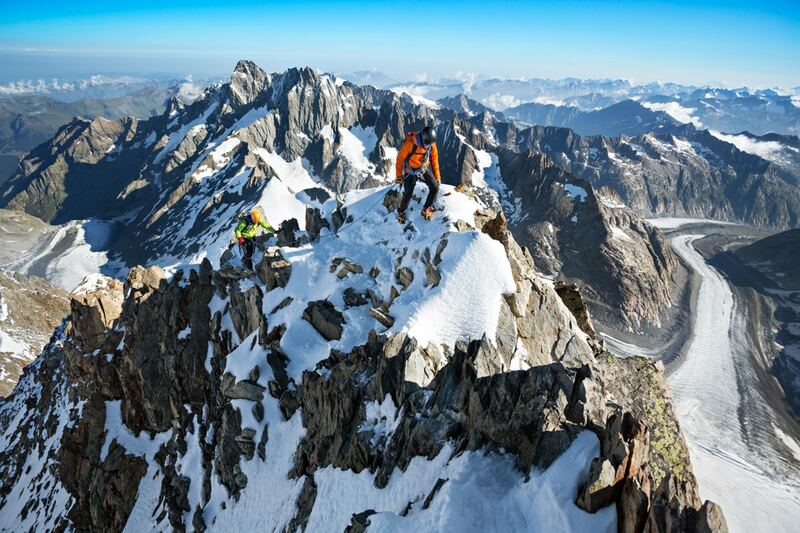 Simply put, there is no quick, or very simple approach to this mountain. While not difficult, the time spent walking on glaciers to the hut makes the experience a bit tiresome. But, it does provide for a very thorough tour of the Aletsch Arena. As such, the mountain is very popular in spring as a ski peak, in fact one of the Alps most famous. Nevertheless, the Finsteraarhorn is a desired summer objective. It is the highest peak of the Berner Oberland, and seen from a distance is a striking shark's fin set amongst more gentle summits. Once at the hut your mood will improve dramatically. The hut is big, modern and beautifully situated. Have a beer and forget about the fact that you also have to retrace your steps. For now, just get ready for the Finsteraarhorn. Odds are you aren't the only one there to climb it, but still, it is always a good idea to go find the route you will walk to the peak. Since you'll be starting in the dark, get to know exactly where you will go when you leave the hut, and where you are headed - it sounds silly, but make the route is to the right mountain... there are often several trails leaving from huts. Much of the climb itself is very similar to what you did getting to the hut, walking on glaciers, except now they're steeper and mentally easier given that you have a higher objective. At the Hugisattel (4100 meters) you'll change gears and head up a rock ridge (II) to the summit. Descend the same route to the hut. And now... how to get out? There are options. > Back to the Jungfraujoch, which is, as you well know, long, but this time ~1300 meters ascent in ~15km. And, you'll need to make the last train if you do this in the same day as the Finsteraarhorn. Not recommended. If you prefer to go back out via the Jungfraujoch, you can 1) Overnight at the Finsteraarhorn Hut and do the whole walk in the early morning hours, or 2) Go the Konkordia Hut after climbing the Finsteraarhorn (~2 hours) and ascend the Aletschgletscher to the Jungfraujoch in the early morning. > Walk out over the Grünhornlücke, down the Aletschgletcsher and out to Märjelenseen to Fiescheralp and a tram ride down to Fiesch where you can ride a train back to Interlaken or Grindelwald. This is also a very long walk, so again, the same options apply, an overnight at Finsteraarhorn or Konkorida Hut is likely. 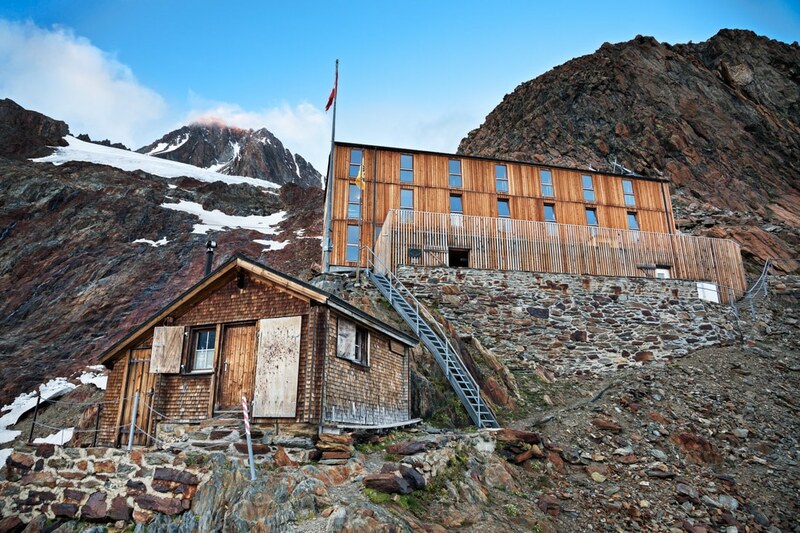 > Walk out via the Oberaarjoch to the east, with an overnight at the Oberaarjoch Hut before walking to the Grimsel Pass. While a beautiful option, the Grimsel Pass has more limited service, and bus only, to start you back to Interlaken or Grindelwald. Clearly this is a big endeavor, more so for the duration of walking time. Of course it is possible to do it in two days, but fitness levels should be high. 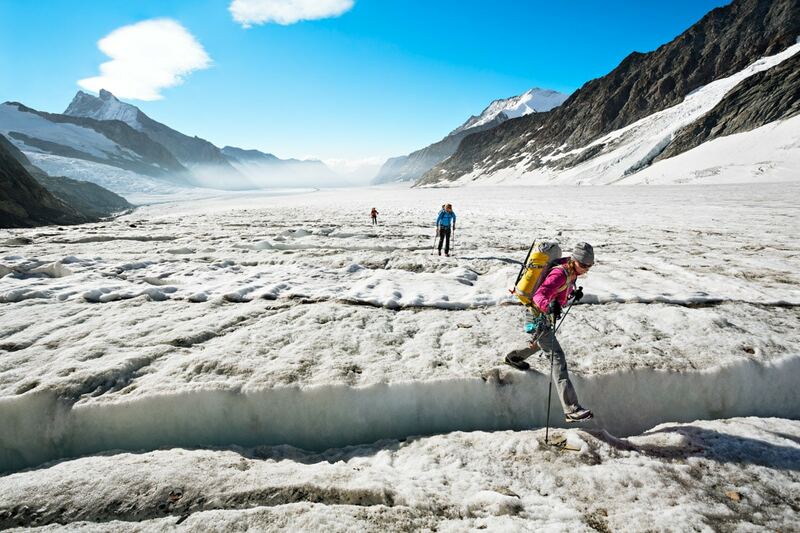 Given the amount of time spent on glaciers, you are going to leave with an all new understanding of the Aletsch Arena, and this is truly the big reward. 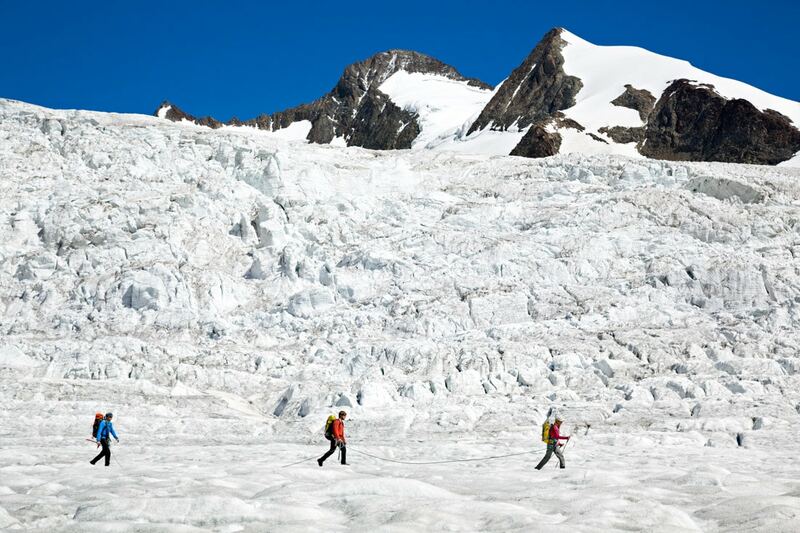 TIP: This is a big trip, go light and be ready for anything on the glaciers. If you don't have an understanding of crevasse rescue or glacier navigation, do not attempt this trip without a mountain guide. Old and modern huts, side by side - the Finsteraarhorn Huts. The old hut is still used as a winter room, and off season hut. The Finsteraarhorn itself, rises up in the background. 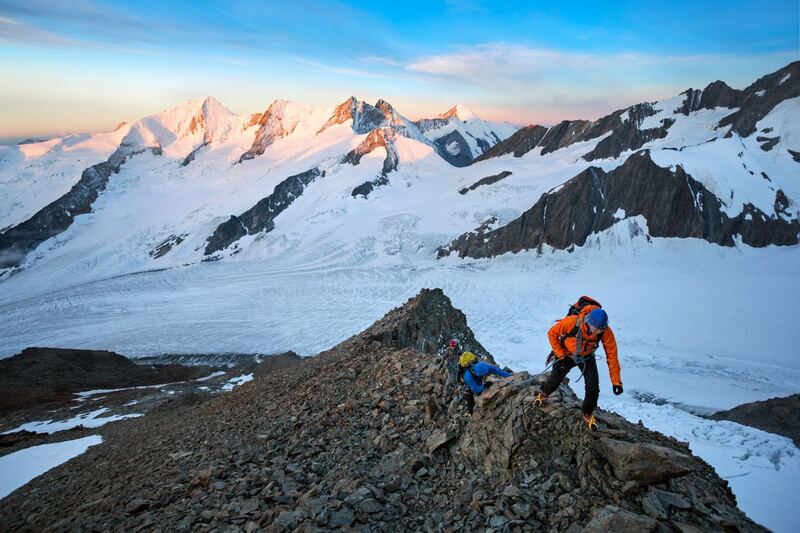 The pre-dawn hours after leaving the hut are spent on wide open glaciers before reaching steeper terrain at the rock ridge. Crossing rock at point 3617 meters where you leave one glacier and turn the rock corner to access the final glacier approach to the upper ridge. Up until about 4100 meters, at the Hugisattel, it is primarily glacier hiking. The final rock ridge is AD. Leaving the Konkordiaplatz and headed for the Jungfraujoch, far in the distance in the low col.
Life on the Alp's largest glacier, the Aletschgletscher. 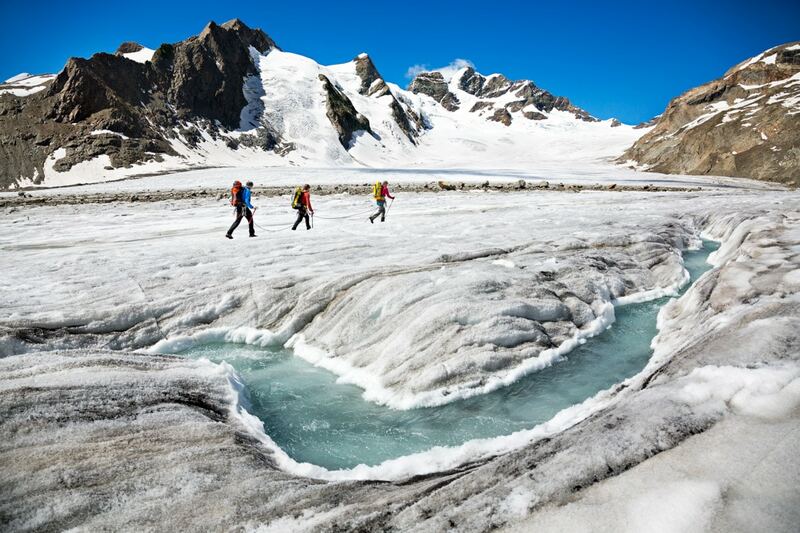 Hiking down the Aletschgletscher for the Finsteraarhorn Hut, near the Konkordiaplatz, the Alp's largest glacier - you'll pass the Ewigschneefald icefall.